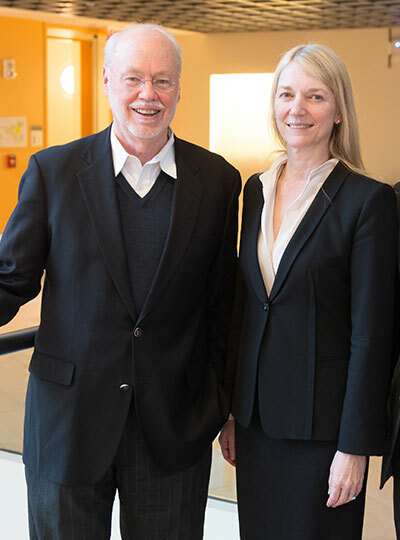 Phil Sharp (left) with Cornelia Bargmann, who delivered the 2015 Sharp Lecture in Neural Circuits. The Phillip A. Sharp Lecture in Neural Circuits is an annual lecture in honor of Phillip Sharp, who served as founding director of McGovern Institute from 2000-2004. A list of past speakers can be found below. Sharp, who shared the 1993 Nobel Prize for his discovery of split genes, has also served as chair of the MIT Biology Department and head of MIT’s Center for Cancer Research (now the Koch Institute). He now holds the title of Institute Professor, the highest academic honor at MIT. As founding director of the McGovern Institute, he oversaw the planning for the institute’s home in Building 46 and the appointment of the founding faculty, including the recruitment of Robert Desimone as the permanent director in 2004. In addition to his academic career, Sharp has also been a pioneer in the biotech industry, helping to found three companies. One of these is Biogen-Idec, whose generous support has made the Phillip A. Sharp Lecture in Neural Circuits possible. Biogen, as it was known prior to its 2003 merger with IDEC Pharmaceuticals, was one of the first biotechnology companies, and Sharp served on its board of directors for almost 30 years following its founding in 1978. During that time Biogen-Idec has been at the forefront of the biotech revolution, growing into a Fortune 500 company with over $4 billion in annual revenues. Its major current focus is now diseases of the nervous system, and we are delighted to highlight the company’s achievements and Phil’s contribution to its success through this lecture. Yang Dan (HHMI, UC Berkeley) will deliver the 2019 Sharp Lecture, “A motor theory of sleep-wake control” on May 28, 2019. Scott Sternson (HHMI, Janelia Research Campus) delivered the 2018 Sharp Lecture, “The Neurobiology of Need” on April 25, 2018. Larry Abbott (Columbia University) delivered the 2017 Sharp Lecture, “Unmarring the Perceptron: Lessons in Cerebellar Computing from Fish and Flies” on March 20, 2017. Markus Meister (Caltech) delivered the 2016 Sharp Lecture,”Neural computations in the retina: from photons to behavior,”on March 8, 2016. Cornelia Bargmann (HHMI, The Rockefeller University) delivered the 2015 Sharp Lecture, “Themes and variations in circuits and behavior,” on March 2, 2015. May-Britt Moser (Kavli Institute for Systems Neuroscience) delivered the 2014 Sharp Lecture, “Grid cells, place cells and neural maps for space,” on February 5, 2014. Karel Svoboda (HHMI, Janelia Research Campus) delivered the 2013 Sharp Lecture,”The cortical circuits and neural codes underlying tactile sensation,” on March 14, 2013. The inaugural Sharp Lecture was given on March 1, 2012 by Okihide Hikosaka of the NIH, a leading expert on brain mechanisms of motivation and learning.